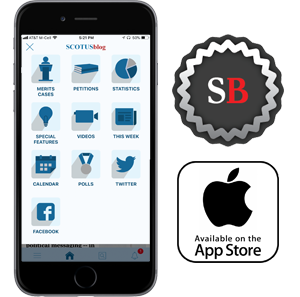 SCOTUSblog aims to cover the work of the Supreme Court comprehensively. SCOTUSblog is an impartial journalistic entity. We exist to provide readers with objective information. We always clearly identify the limited commentary we publish, which we generally confine to online symposia. We also attempt to avoid any appearance of bias or favoritism, including towards the clients of attorneys who contribute to the blog. If at all possible, we avoid publishing pieces favoring one side of a case; we instead have pieces with contrasting views. No person shall have any involvement in reporting on any case in which he or his firm, including Goldstein & Russell, P.C., plays any role, other than a submission that does not in any respect advocate for any outcome in the case. The blog staff will note firm merits cases only when required to provide comprehensive coverage – for example, describing an order granting certiorari and furnishing basic details about the case – but will not otherwise comment, report or pass judgment on the cases. The blog will not suggest that a petition for certiorari filed by the firm is deserving of review on the merits by the court or suggest that a case in which the firm has filed a brief opposing review is not worthy of review. The blog will note petitions in which the firm is among the counsel to the petitioner or respondent in its “Petitions of the Week” feature (so as not to inadvertently disadvantage either party to the litigation), but it will clearly state that such a listing occurs without regard to the likelihood that certiorari will be granted. The only exception is the extremely rare petition in which the firm is among the counsel to the respondent but does not appear on the briefs in the case. In that rare instance, because the firm is opposing review, no advantage can be created when the petition is listed. In such a case, the blog staff will not even be informed that the firm is involved, in keeping with the firm’s pledge of confidentiality to its client. Because the blog covers every merits case, it will report on merits cases in which the firm serves as an attorney to a party. But all reporting on those cases shall be done by a person who has complete independence from the publisher and the firm – i.e., a person other than the blog staff, Amy Howe and the firm staff. Moreover, as this January 2016 post explains, the blog’s coverage will not contain any assessments or judgments about the relative strengths of the parties’ arguments, which side is likely to prevail or what the case’s broader impact might be. 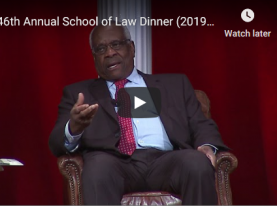 The policy of not noting new Supreme Court filings by lawyers who contribute to the blog and the clinics with which they are affiliated is long-established and remains in effect. The blog never seeks to influence the court’s decision making. We are aware that the blog is widely read within the court, however, so we have adopted these policies to avoid any appearance of impropriety. On the blog, we note all substantive corrections to content (i.e., everything more significant than typos and minor rephrasings). To do so, we add “(Corrected)” to the title of the post and and we insert an explanatory note in bold at the bottom of the post describing the change. All corrected posts will be linked on our “Corrections” page. If you find an error, please report it to feedback [at] scotusblog.com. Whenever we make a material addition to a post, we add “(Updated)” to the title of the post and we insert an explanatory note in bold at the top of the post, noting the time and date of the change. Every email sent to feedback is reviewed by a member of the blog staff. The feedback we have gotten to date has played a critical role in improving the blog, and we try whenever possible to reply to emails. However, given our limited resources, we do not guarantee either responses or that ideas sent to us will be acted on. SCOTUSblog holds an “Attribution Non-Commercial No Derivatives” license from Creative Commons. That means that our content may be reproduced and redistributed without our permission, but only if it is attributed to SCOTUSblog and neither used for profit nor modified. If you are uncertain whether your use of blog content is permitted under this license, please contact feedback [at] scotusblog.com.